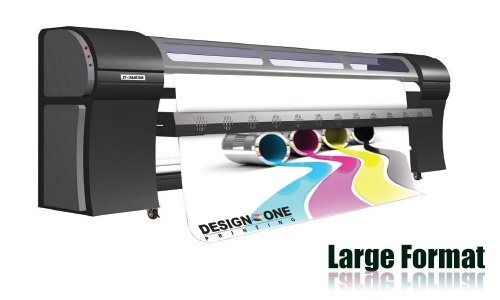 Our Large Format Printing division is trusted with materials equipped with the latest technologies in large posters, banners, and display printing. All Large Format orders are printed in high quality and have a quick turn around time! Commercial printing companies use large format printing on a number of marketing materials to capture the customer’s attention. Display boards for special promotions, trade shows and other special events offer the opportunity to increase your brand recognition. Keep in mind that large format printing requires a different type of printing and may take longer than standard printing jobs. Make sure the file you send to your printing company is the correct scale. Include file extensions, printer fonts and copies of your screen. You should also convert your file to a PDF format for submission.Review your PDF format to ensure the fonts are converted properly. The image resolution should be set at 300 dpi when placed in your document. Colors will vary according to the type of computer you are working on. Check your proof to ensure the colors, font and design matches your expectations. Large format printing presents unique challenges since it must be converted to the correct scale.Large format printing works well for signs and banners for companies who need to advertise for special promotions such as grand openings. Vinyl banners are durable and best for outdoor signage. They are easy to print because they are simple in design. A simple tag line and possible company logo is all that is needed to print a banner. Large format printing on banners must be visible at a distance. Indoor banners with large format printing look best with only one or two colors. Too many colors on large posters will take away from the marketing message. Choose one word or phrase to communicate your message clearly to your audience. Develop your marketing plan several months before your event to ensure you have your printed materials back from the printer in time. Commercial printing companies have busy times of the year where you may have to wait longer than usual. Printed materials are essential when you are trying to attract customers at a trade show or other special event. Develop your marketing budget to include all your printing needs. A direct mail campaign is a great way to introduce your company to a specific geographical area. Postcards, flyers and brochures are the perfect printing medium for a direct mail campaign. Some printing companies also offer mailing services that will save you time. Call several different printing companies and ask for a price quote for your printing jobs. Once you have found a printer that delivers quality work, you can depend on that printer for all future printing jobs. Consider scheduling your printing jobs when your printer offers special discount promotions. Even if you must pay more for a high-quality printer, the results are well worth it.